Do you have a Hoarder in Miami? If you are a hoarder in Miami, allow us to be of service to you. Yesterday, we answered a called from the family members of a hoarder in Miami. They asked us to take a look at their father’s home for cleanup. We replied that we could recommend a maid service. However, they insisted that ServiceMaster by Alpha Restoration come out and take a look. Yesterday, when we arrived, we experienced a hoarder situation. This is a situation we see time and time again in Miami. The family members stated that others walked away from the job once they visited the site and they were afraid to tell us that their father was a hoarder. We reassured the family that we specialize in hoarder cleanup. 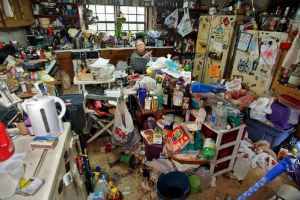 If you have a hoarder in Miami, we can help you with the cleanup. Additionally, we are not therapist, but we understand the behavior of hoarders. Do not hesitate to call us if you have (or you are) a hoarder in Miami. We also protect client’s privacy. This photo is not the client, but we have experienced hoarder activity in Miami from minimal to the extreme. Call us at 305-899-1600. In the meantime, click here for information from the National Institute of Health.